Looking for construction invoice templates? We've got you covered! Do I need more than just a construction invoice template? If your construction company is still under construction, you might be trying to figure out exactly how you want customers to pay you. Building sky scrapers might be your specialty, but that doesn't mean you necessarily know how to make your own invoices. That's where construction invoice templates come in. Luckily, you're in the right spot. ZipBooks allows you to perform business tasks which include setup recurring billing and other non-invoice things like reconciling your bank account. That's not something you're going to be able to do with many other free invoicing software programs let alone a construction invoice template. 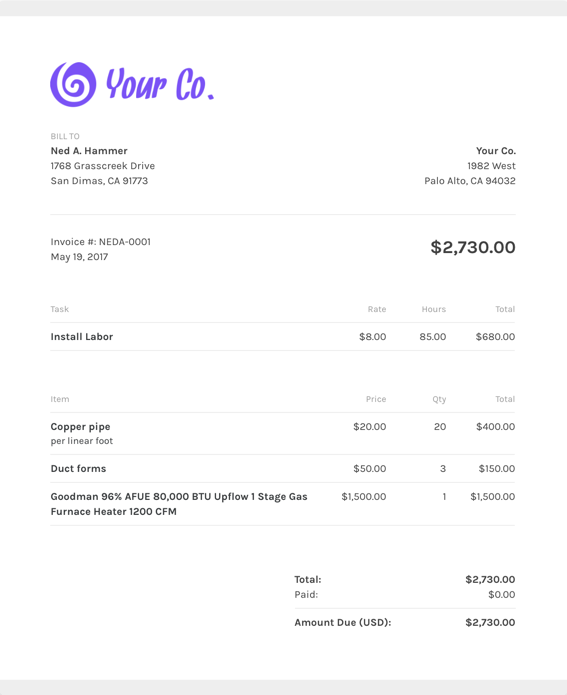 What should I include on my construction invoice template? One innovative feature of ZipBooks invoice templates is that we will help you through every step of sending your first invoice. We help you to know what to include in your invoice based on real-time feedback that we provide in the form of a invoice quality score. Using ZipBooks for your construction invoice means never sending off an invoice without your own company’s information on it (oops!). We’ve collected data from tens of thousands of invoices and use it to score your invoice based on what information you include so you’ll get you paid faster. Why should I use ZipBooks’ construction invoice template to create and send my construction invoice?